From left to right: Arnaud D’Argembeau, Anna Abraham, Jennifer A. Bartz, and C. Robert Cloninger take questions after presenting cutting-edge talks on psychobiological and neural approaches for studying personality. 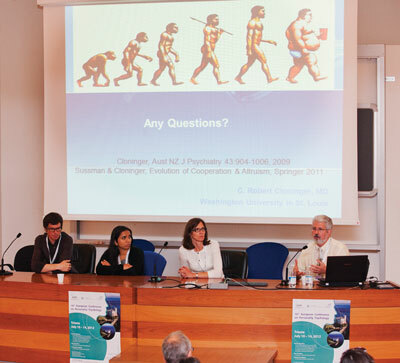 With the goal of advancing a cognitive neuroscience of personality dynamics, leading researchers from the United States and Europe gathered in Trieste, Italy, on July 10, 2012, to present cutting-edge findings on the neural and evolutionary bases of intra-personal processes and structures. The event, sponsored by APS, featured Anna Abraham, Jennifer A. Bartz, Arnaud D’Argembeau, and C. Robert Cloninger, and it was organized by APS Fellow Daniel Cervone, chair of the symposium. In the beautiful framework of Trieste, the event preceded the opening of the 16th European Conference on Personality, which featured more than 500 participants from about 40 countries. The advent of neuroimaging techniques has enabled researchers to extend the investigation of individuals’ stable patterns of affect, behavior, and cognition to the neural substrates within their brains. Most research conducted on this topic has sought to reveal the genetic basis of inter-personal differences, especially the biological foundations of personality traits. More recently, researchers have started to investigate the intra-personal dynamics of individual functioning, such as the way people reflect on themselves, how people interpret their inner and outer worlds, and how people project the self in the future. In this spirit, the meeting’s main theme was an overview of brain structures and functions that may contribute to explaining personality functioning. Each speaker approached this theme differently. Anna Abraham, from Justus Liebig University Giessen, Germany, presented fMRI findings on the neural substrates associated with different forms of mental state reasoning. Her results highlighted the medial pre-frontal cortex’s (mPFC’s) prominent role in processing self-referential information, as well as its role in reasoning about hypothetical scenarios involving the self. Such findings suggest that it would be possible to infer whether an individual’s thinking involves the domain of the self by looking at the activity of the mPFC at a certain time. There have also been interesting trends in research on how hormones influence personality. Jennifer A. Bartz from McGill University, Canada, discussed the biological bases of prosocial behavior by describing the effects of oxytocin on various outcomes, including trust, empathic accuracy, and cooperation. Although it is generally believed that oxytocin improves prosocial behavior, Bartz’s findings suggest that this is not entirely correct. The effect of oxytocin is actually moderated by important situational and personal factors. For instance, in one of the studies she presented, oxytocin improved empathetic accuracy only for those who were less socially attuned to others. Situational cues may also affect whether oxytocin will increase or decrease cooperation and trust. The fact that the administration of oxytocin may have such divergent effects depending on the context and the characteristic of the person has important implications, especially for the employment of oxytocin in clinical settings. Arnaud D’Argembeau, from University of Liège, Belgium, presented studies on the neural correlates of self-referential thinking. He summarized research showing that the mPFC is strongly associated with self-processing. In particular, he reported increased activation in the mPFC in semantic as compared to nonsemantic judgment. Furthermore, D’Argembeau showed that the level of activation of the mPFC is directly related to an individual’s perceived similarity with other people: The higher the degree of inclusion of another person with respect to the self, the stronger the activation of the mPFC. He hypothesized that the mPFC might play a fundamental role in processing self-referential and self-related information by modulating the degree to which that information is included in the mental model of the self at a given time. In addition, he suggested that subregions of the mPFC might support specific self-referential processing, such that activation of the ventral mPFC might indicate the value given to self-information processed at a certain time. The final speaker, C. Robert Cloninger from Washington University in St. Louis, offered an evolutionary perspective on brain anatomy and function. He presented personality as a complex psychobiological system characterized by high plasticity and adaptation. According to Cloninger, all human beings share a universal structure that allows them to understand one another. At the same time, adaptive processes occur within the individual and are intrinsically idiographic. He showed results on the association between character type (such as being self-directed, cooperative, or self-transcendent) and happiness, and he highlighted the role of self-awareness as an overarching characteristic that enables individuals to improve well-being by fostering the expression of a mature personality. Overall, he conveyed the idea that personality is not only the result of the interaction between genome and environment, but it depends on the individual to make sense of the inner and outer world. Bringing together psychobiological and neural approaches, the symposium provided new insights on how personality functions. The presenters discussed neural substrates responsible for commonalities among individuals, as well as mechanisms accounting for the uniqueness of each human being. 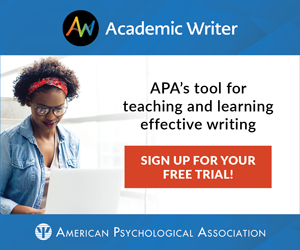 Importantly, they showed how neuroimaging techniques may help to explore the boundaries of the self and to identify self-reflective mechanisms that promote personal well-being. Ultimately, the symposium presented the latest trends in personality psychology, a domain that is becoming increasingly cross-disciplinary. teaches courses at the Faculty of Business and Economics of University of Lausanne, Switzerland, and conducts research on the topic of emotional intelligence. She is primarily interested in the psychological science of personality, especially how individuals differ in processing emotion information and how those differences lead to various behavioral outcomes. She can be contacted at marina.fiori@unil.ch.